Throughout a series of lessons I will gently guide you through simple everyday movements such as sitting, standing and bending whilst giving you verbal instructions that help you let the movement happen in a new and fresh way rather than your old habitual way. I will also gently support release to happen whilst you lie on my firm teaching table in what we call 'semi-supine'. If, on arriving, your mind is finding it hard to be present I will support you by listening to you whilst encouraging you to notice your surroundings and your body until your mind is ready to be present. 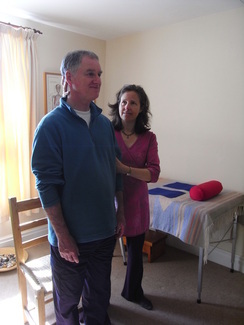 Generally people find the lesson experience calming, safe, supportive and notice their body feeling more open, lighter and in less pain. People mostly walk out feeling more present than when they walked in. Occasionally, emotions rise to the surface. As bodily release happens - so do the emotions. If this happens I provide a safe and accepting environment so that these feelings can simply move through you in their own time so that healing can happen. How many lessons might I need? As a very rough guide, many people find that a course of lessons of about 25-30 over about 4-8 months gives them the skills they need to carry on alone or with only occasional 'top up' lessons from their teacher.